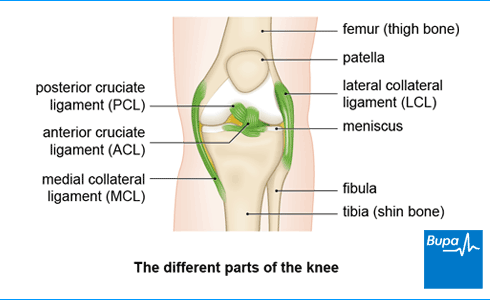 Your lateral collateral ligament (LCL) is one of the ligaments inside your knee. It lies on the outer side of your knee joint, connecting your thigh bone (femur) to the small bone in your lower leg (fibula). It’s sometimes called the fibular collateral ligament. Along with the other ligaments in your knee, your LCL provides your knee with stability. Your LCL and your medial collateral ligament control the sideways movement of your knee. An LCL injury can be a partial or a complete tear, or an overstretch of the ligament. Knee ligament injuries are also referred to as a sprain. They’re given different grades depending on how severe an injury it is. Your LCL is often grouped together with other ligaments and tendons in an area of your knee called the posterolateral corner. An LCL injury is often associated with injuries to the ligaments and tendons in this area, as well as to other parts of the knee. The symptoms you have may be related to other parts of your knee that you’ve damaged, as well as your lateral collateral ligament (LCL). You’ll probably have some pain on the outside of your knee. You may have some bruising and swelling in the area of your injury. Depending on the severity of your injury, your knee may also feel a little unstable, as if it’s going to give way. It’s common to damage a nerve in your knee at the same time as your LCL. If this happens, you may have some weakness around your foot and ankle. Your lateral collateral ligament (LCL) is usually injured by your knee being pushed outwards (away from your other knee). This may be due to a blow to the inside of your leg, which can happen during contact sports such as rugby. You can also injure your LCL by twisting on the side of your foot, or extending your knee beyond its normal range of movement. You may also injure your LCL along with other ligaments in your knee if you have a major accident. For example, if you fall from a height or have a motor vehicle accident. The treatment you’re offered for your lateral collateral ligament (LCL) injury will depend on how severe the damage is. It will also depend on whether any other parts of your knee have been injured. The initial treatment will be to control your pain and swelling using the PRICE and HARM self help measures. Details of these can be found on the next tab – Treatment: self-help. Further treatments include knee bracing, physiotherapy, medicines, and in some circumstances, surgery. If you’re having difficulty bearing weight on your knee, you may need to use crutches or wear a brace to support you for a while. It’s common to wear a leg brace for several weeks after an LCL injury. Making sure you follow any physiotherapy and rehabilitation programme you’re given will be an important part of your recovery. Often, treatment with physiotherapy and leg bracing will be all you need if you have an LCL injury. Physiotherapy should help your knee recover its full range of movement and its strength and stability. This should help you get full function back in your knee and return to your usual sports and activities. Your physiotherapist will carefully assess your knee and then plan a programme of rehabilitation exercises to suit your individual needs. You can take over-the-counter painkillers, such as paracetamol or ibuprofen, to help relieve your pain. Your doctor may prescribe stronger painkillers if your pain is severe. As well as easing your pain, non-steroidal anti-inflammatory drugs (NSAIDs) such as ibuprofen may help to reduce inflammation and swelling. Always read the patient information that comes with your medicine, and if you have questions, ask your pharmacist or GP for advice. Most people with a mild or moderate LCL injury won’t need surgery. If your LCL injury is more severe, it’s likely that you will have damaged other parts of your knee too. In these cases, surgery is often the best option to repair your LCL and help to restore stability in your knee.